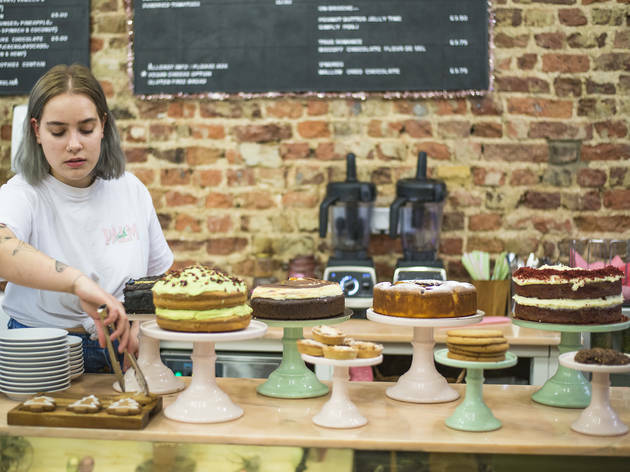 A pasteltastic Hackney café serving coffee, cake and meals. You know those super-cute, uber-quirky interiors you’re always lusting after online? The ones full of pastels, pot plants, retro prints and mid-mod furniture? If the answer is ‘nope’ then you might want to stop reading, since Palm Vaults – which landed on the pedestrianised top end of Mare Street this summer – is totally committed to its eccentric look. From the enormous cheeseplants to the luscious pink and green icing on the cakes, the vintage marble-topped tables and exposed brick walls right down to the pink paper in the till, every tiny detail is geared towards aesthetic nirvana (2016 edition). 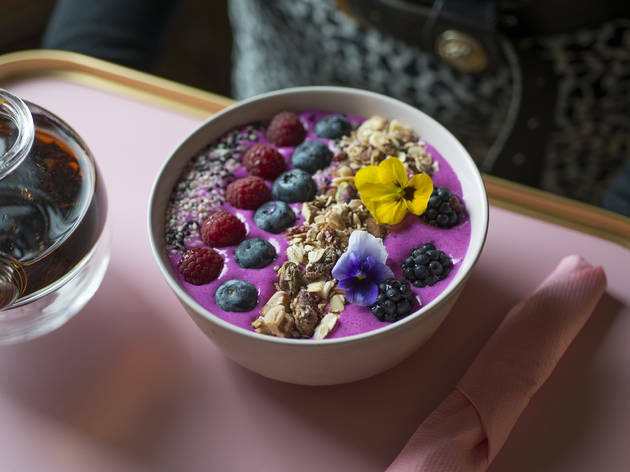 For better or worse, it’s been called ‘London’s most Instagrammable café’. What’s surprising is that Palm Vaults is more than just a pretty face; it does the business when it comes to eating and drinking. 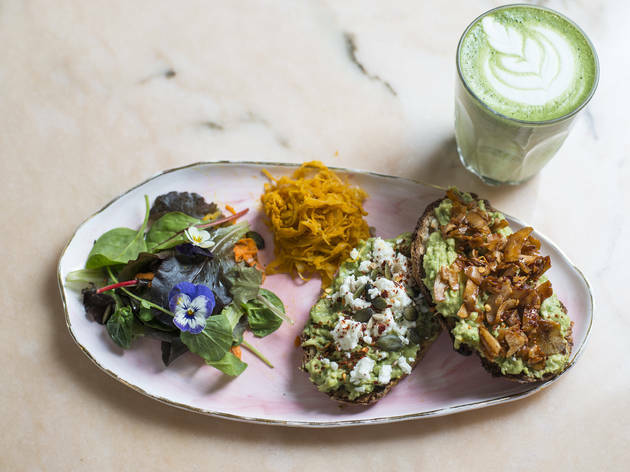 When it first opened, this place didn’t serve much more than coffee, though we’re talking more than greasy-spoon cappuccinos – matcha frappés, avocado coffee and colourful rose, aqua and lavender lattes appear on the pegboard menu alongside five hot chocolates and nine loose-leaf teas. Ditching dairy? Then try soya, coconut, oat, almond and cashew alternatives to cow’s milk. That’s a whole lot of vegan coffee combinations. Now, Team PV have also added breakfast, lunch and brunch to the equation. 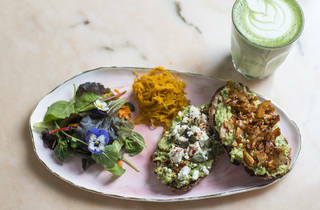 They do avocado on toast, obviously, but again there’s a twist: chilli, seeds and (optional extra) bits of downright delicious vegan ‘bacon’ made out of coconut. The spinach dhal was a warming and authentic treat too. Add a slice of courgette, matcha and lemon cake for lunch beneath the palms. It’s not the most affordable meal in Hackney, but for a tropical escape this winter it’s a damn sight cheaper than Miami. 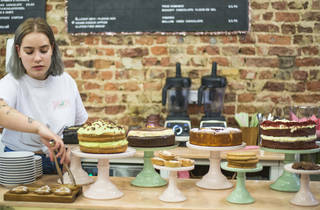 Independent cafe and coffee shop in Hackney, London. Lunch for two with drinks and service: around £25. Can't believe I've lived in London so long without visiting Palm Vaults. It's right up my street! Cute & cool decor in this little cafe. Lots of insta opportunities, and a bit more under the radar than the pink galore insta cafe's we see in the centre these days. I attended a Modern Calligraphy class one evening. It was a private event, so had the whole place to ourselves. For refreshments, we had a choice of the beautiful rainbow latte's. I chose 'Velvet Rose', pretty pink & warming. Delicious. The apple tart was also very tasty. With such a great menu and gorgeous array of cakes to choose from, I will definitely be back! 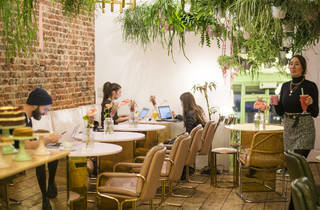 One of the cutest Cafés in East London. Décor is adorable - room filled with palm plants, pink marble, blush velvet sofas and gold accents, I mean what’s not to love!? Sitting there made me want to dress in pink crushed velvet pants and fluffy jumper and eat their pink cakes all day!! I had their banana bread with fresh fruit and coconut yogurt and tried turmeric latte, very yum. Heads up, place is small so consider yourself lucky if you manage to get a spot! Pretty pictures, somewhat tasteless food. The internal decor is fab and the presentation of all dishes is outstanding. Our group however found the food to be slightly tasteless and bland. The food also took a long time to arrive on a busy Sunday which added to the disappointment. The vegan concept is great and there are lots of options on the menu, flavors however need to be worked on to make this a true Hackney gem. The Paulm Vaults is the pastel dream, a little bit of wonderland (the decoration, the optical illusion with the mirrors, the cutlery, etc.). The drinks menu is great, my blue latte (with lavender) took my breath away and the cakes are also dreamy. Arrive early, because it gets packed very soon. I swung by here Saturday afternoon and was instantly charmed by the pink and green theme with palm fronds all about. It is very cute. The drinks menu is just breathtaking honestly with its vast array of choices. I finally settled on the turmeric hot chocolate and I liked it quite a bit but the turmeric is very strong so keep that in mind. I got two desserts for takeaway: the chocolate chip cookie and the hazelnut sponge with chocolate cream. Both were rich and chocolatey, and did not taste traditionally vegan. The cashier/ counter staff was helpful and joked around with me. I would return for the savoury items. Because when you’re unemployed, everyday feels like the weekend. Therefore, what’s else would I be doing on a Monday morning? Brunch, of course! My best friend had the day off work so we decided to head out to a part of London neither of us frequents, East London. 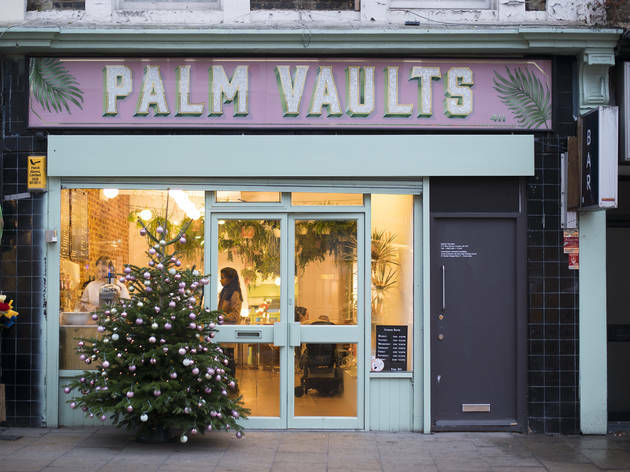 Both of us read about Palm Vaults in Time Out London, where it is described as “London’s most Instagrammable café”. With such a bold statement, how could we not check it out? The interior decor of the café is fitting to its name. It transports you to a tropical island with potted plants hanging from the ceiling, the pink walls, and the touches of gold from the full length mirrors at the back. The marble topped tables paired with the vases on each table adds to this calming atmosphere and makes for a lovely experience. I liked that we could sit down and browse the full menu before placing our orders at the counter. It didn’t feel rushed, which was nice because their drinks menu was rather extensive! For my drink, I ended up going for the Velvet Rose Tonic Latte with oat milk. This came out beautifully with a perfect latte design, a thick and frothy layer on top, and in a gorgeous pink colour! It tasted quite neutral with the flavour of the oat milk coming through the strongest. It was rather hard to actually taste any of the beetroot juice and the rose water, but they did make it look aesthetically pleasing. For my main, I was in the mood for something savoury so I had the Heirloom Tomato & Basil Open Toast. This was a change for me, as I normally go for the typical avocado toast when I brunch, but I’m glad I got it! There was a mount of thickly sliced heirloom tomatoes in various colours stacked on top of 2 slices of sourdough toast along with dollops of pesto and micro-greens. As you can tell from the picture, this was a rather generous serving but not too heavy because the tomatoes kept it light and refreshing – each and every bite was juicy and flavourful, especially with the pesto! The presentation was on point, making it a colourful dish and I liked the design of the plate it came served on. I couldn’t resist ordering a second drink because a) they tasted really good, b) they looked beautiful, and c) I liked that there was no additional cost for using alternative milks. I went for the Midnight Tonic Latte, which is originally made with coconut milk but I had mine with oat milk again and they add charcoal dust/powder to give it that midnight black colour. Again, I liked that the milk frothed up well, the taste of the oat milk was present and that there wasn’t much taste from the charcoal but it does do your body some good apparently! I had a truly beautiful and satisfying meal and experience here, and I can guarantee that I’ll be back again soon. I’m determined to make my way through all the Tonic Lattes and even their regular coffees! The prettiest coffee I have ever had! 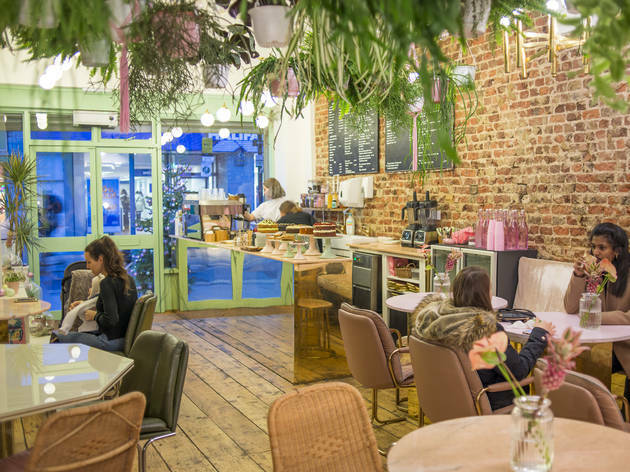 This vegan styled shabby chic café offers a variety of delicious and beautifully presented food and drinks! I opted for their homemade warm banana bread served with pink coconut yoghurt and berries, which tasted and looked amazing! Their bacon flavoured coconut shavings were also very impressive and a must try! The staff were very friendly and the overall vibe of the café was lifting and lively. I will certainly be returning again soon! Palm Vaults is one of my favourite brunch spots in East London. 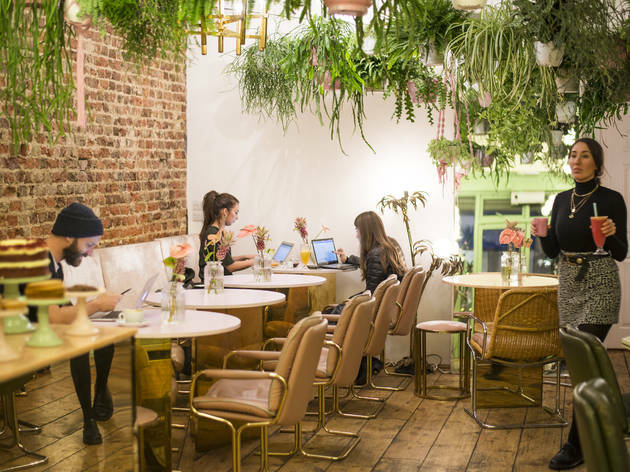 Just a stone's throw away from Hackney Central station is this pastel-perfect cafe that instantly transports you to 1970s Miami when stepping inside. 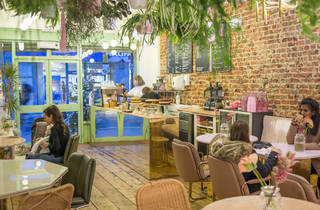 It's easily one of the most Instagramable spots in London, full to the brim with green plants which dangle from the ceiling, open brickwork walls and dashes of baby pink. 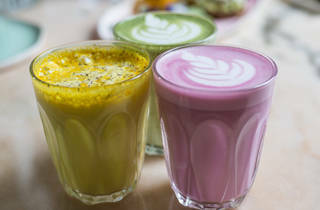 The menu offers several different colourful lattes, a typical yet exquisite avocado on toast and lots of homemade cakes! If you're planning to visit on a weekend, it's worth booking in advance as due to its popularity we had to wait an hour before being seated last time I visited. It's likely to be a lot quieter during the week. 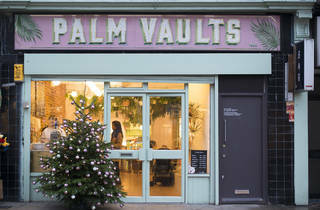 If you're ever in the East end, it's worth taking a trip to Palm Vaults! Palm Vaults has been on the top of my list of brunch places to go to for a long time, especially since I almost get daily reminders of how lovely it looks on Instagram. I went on a weekday, which I can very much recommend as my friend and I got a table straight away and the place was not crowded at all. And wow! It looked even prettier than it does in the countless Instagram photos I’ve seen lately. You might think that you have seen every angle of the place in these photos, but you are mistaken. It’s the cutest little place, full of colour, fresh flowers, plants, gold and marble details and suede details. We went there for brunch and the menu was really nice. Everything sounded so tasty and there was a focus on fresh ingredients. It was really hard to make a decision! I finally went with heirloom tomatoes with homemade pesto on sourdough toast and added crumbled feta to the mix. It tasted amazing and it was so fresh, just perfect for a summer morning! My friend went for figs, goat cheese and walnuts on sourdough and it tasted just as good as it looked. Bonus: Gold cutlery! Could this get more Instagrammable? On a concluding note Palm Vaults is great and even though it might not be hidden, it’s definitely a gem! 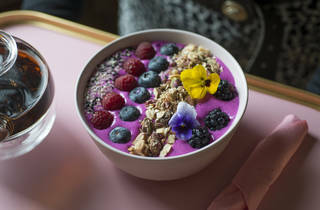 Frequently listed as one of the most instagrammable venues in London, Palm Vaults on one of the most unexpected streets in Hackney opens its door to a crazy pink, vegan oasis and lives up to its reputation. The owner supports and employs women here and they do a pretty good job representing girl power. There are so many options to choose from on the menu. The banana bread that comes with pink yogurt is delicious. Their cakes are made by Hebe Konditori and they always look smashing. Their drink menu covers all the colours in a rainbow and are always fun to try. They always introduce new delicious smoothies and breakfast bowls into their menu. Some of the flavours here take time to get accustomed to but it is always pleasant to be here. I only wish they had an outpost in Central London. It's hardly a surprise if you've seen this place as the shoot location for at least three magazine spreads before even stepping inside yourself. Or spied their pink and green palm tree coffee cups. With the interiors decked out like a love child between Jacqueline Susann and David Lynch, born and raised in 80s Miami, it's the most inviting hyper pastel palace you've ever seen. Let alone it serving red velvet lattes and vegan eats. Can I please just move in? This cafe manages to be both twee and slick. The branding is over-the-top, with the cafe's logo and signature pink shade everywhere. The staff are kind but the prices aren't. What a refreshing change from the run of the mill coffee shops dotted around. Palm Vaults blows your senses, both visually and tasting wise, a delight in every way. The food is excellent as are the drinks and the staff couldn't be friendlier. My visit was wonderful in every way. Thank you Palm Vaults for creating this little gem and how great, it's independent. Palm Vaults caters for people who care about the world and what they put in their bodies. It's interior is something to behold, which is great in itself, but the food and coffee are exceptional too. It's so refreshing to have such a good , independent, alternative to Pret and Starbucks... it puts them to shame really. Treat yourself to a visit. This place is an absolute gem. Much more than the sum of its individually rather excellent parts. Sure, the interior is the most beautiful of all the cafes I’ve visited, a retro pastelly confection of marble, rose gold, pink and green. But even if it were not the most Instagram-friendly spot in the East, I’d keep coming back for the zen atmosphere, the light, brightness, the friendliness of the staff, and the reasonably-priced fab drinks and cakes. My white chocolate hot chocolate was velvety and light, whipped up with almond-milk, and the fact that it was the most delicate shade of pink was merely a cherry on top. My gal pal and I have had this quirky café on our radar for a while and finally made the journey to Hackney last weekend. Walking down Mare street I had my fingers crossed that it would live up to all of my Instagram dreams, and 'm glad to report it didn't disappoint in terms of pure joyful aesthetics. It is a plant lovers dream, and after recently joining that club I was fully appreciating the ferns and cacti on offer hanging from the pink and green walls. It's pretty cosy inside which I wasn't expecting so we were lucky to grab a seat (beside the hanging Versace jeans no less darling). 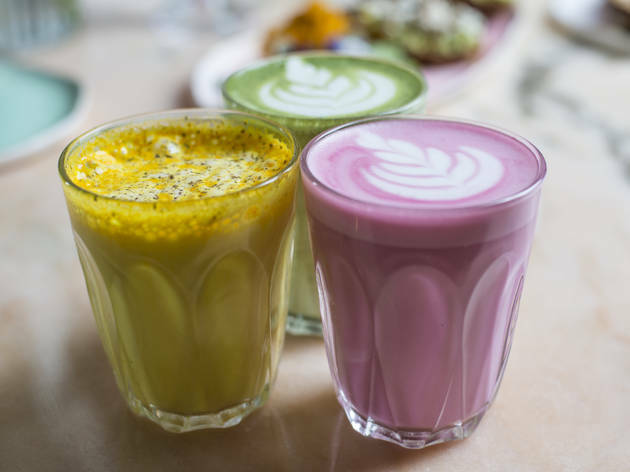 The menu is a bit of a minefield with so many different types of coffee on offer, from velvet latte (beetroot apparently) to frappes, with a host of smoothies and juices too. I tried a mocha frappe which sadly came without ice cubes so it was a tad luke warm but I held out for the Avocado on toast. This was nice but it could have been bigger and so much fresher tasting, although kudos for the pretty pink serving plates. We were enjoying the surroundings so much we also decided to indulge in some of the mouth-watering cakes on the counter. We had a slice of matcha cake which was lovely but pretty heavy so we ended up leaving some which almost never happens! Our order was also forgotten and I had to chase it up at the till which was annoying as they weren't even that busy. All in all,a very cute little café very close to my other favourite bar/ music venue Oslo. Not sure I would head back but any interesting independent hang out that's trying to be different still gets my vote.